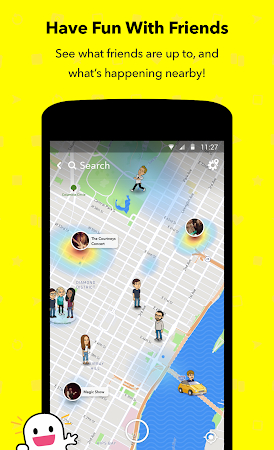 Snapchat is the most fun way to share the moment with friends and family Snapchat opens right to the camera, so you can send a Snap in seconds! Just take a photo or video, add a caption, and send it to your best friends and family. Express yourself with Filters, Lenses, Bitmojis, and all kinds of fun effects. SNAP Snapchat opens right to the camera. Download the .apk installation package of Snapchat 10.8.0.0 that is completely free of charge and have a look at users' reviews on Droid Informer. This application setup package requires 56 MB to be successfully installed. The app is created for Android 4.4 and higher. The antivirus report shows that this application is totally safe. 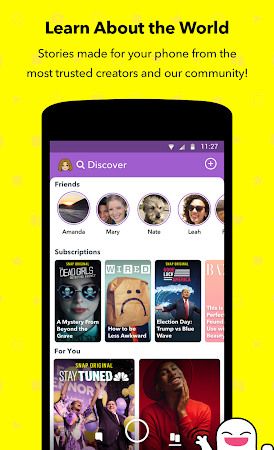 Snap Inc has created Snapchat that lies within the Social tools category. The latest update of the app was launched on Mar 28, 2019 and this application has been set up by over 0,5B users. 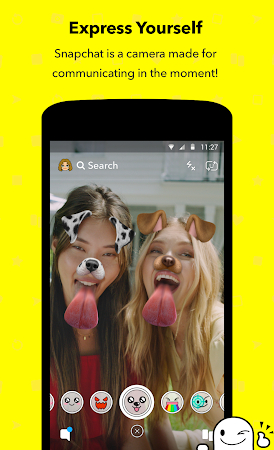 According to the latest information, Snapchat is rated 4.1 on Google Play and can be legally downloaded by people aged 14 and older. In-app purchase items and ads can be found in the app. Samsung and LG users install this application quite often. 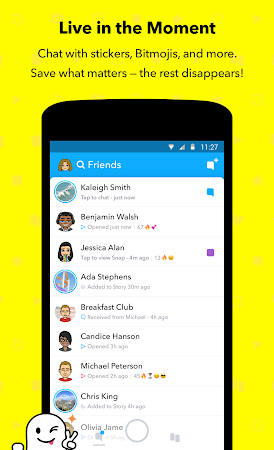 In users’ view, Snapchat boasts such strong sides as useful features and constant updates. Some users have paid attention that the app possesses the following disadvantages: a horrible interface, formatting issues, annoying ads, a battery drain and a lack of support. How do I delete all of the snaps sent to me? Explore the world with ARGO~ ARGO connects you with people across the world. Begin the day with these beautiful Good Morning pictures. Happy Halloween 2018. The Fantasy and Folklore of All Hallows .